TMC faculty and affiliates Ray Barfield, Farr Curlin, Warren Kinghorn. 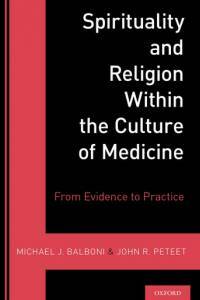 Brett McCarty, and Sarah Barton are contributors to Spirituality and Religion Within the Culture of Medicine: From Evidence to Practice. “The book provides trainees and clinicians with an introduction to the field of spirituality, religion, and medicine, and its multi-disciplinary approach gives researchers and scholars in the field a critical and up-to-date analysis. The volume assesses the strengths and weaknesses of the most recent empirical research of religion/spirituality within 12 distinct fields of medicine; turns to academic scholarship outside the field of medicine to consider cultural dimensions that form clinical practice; and identifies the best studies in the field of religion and health, ongoing weaknesses in research, and what can be confidently believed based on prior studies.” Read more.